The "Codrington House" address of the S.M.R.C., at the time the above card was printed, indicates that it dates prior to 1943. 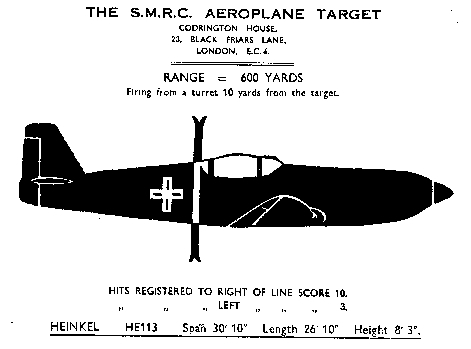 The " Mayleigh" address on the targets below shows they are post 1943 but pre-1947 when the S.M.R.C. became the N.S.R.A. Click the above image to access a downloadable high resolution JPG file of the 15 yard target. For scaling, the actual size of the printed card should be 149 x 125 mm. 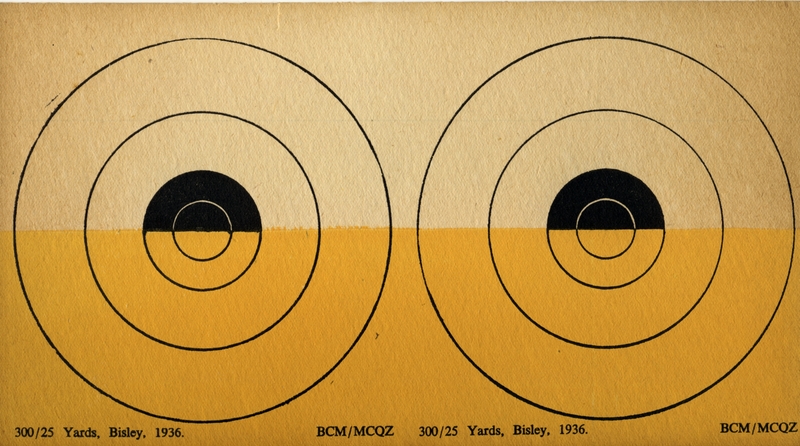 and below, the 1936 Bisley equivalent coded BCM/MCQZ to be shot at 25 yards, but representing 300 yards full-bore (.303") distance. Click the above image to access a downloadable high resolution JPG file. For scaling, the actual size of the printed card should be 219 x 120 mm. 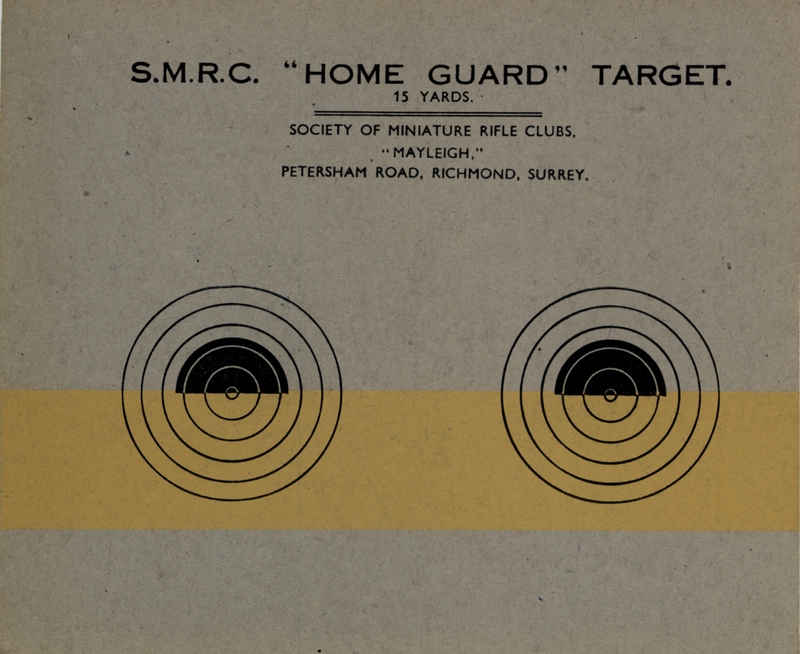 and below, a commonly used "Snapshooting" target oft seen on schools and cadets ranges of the period. 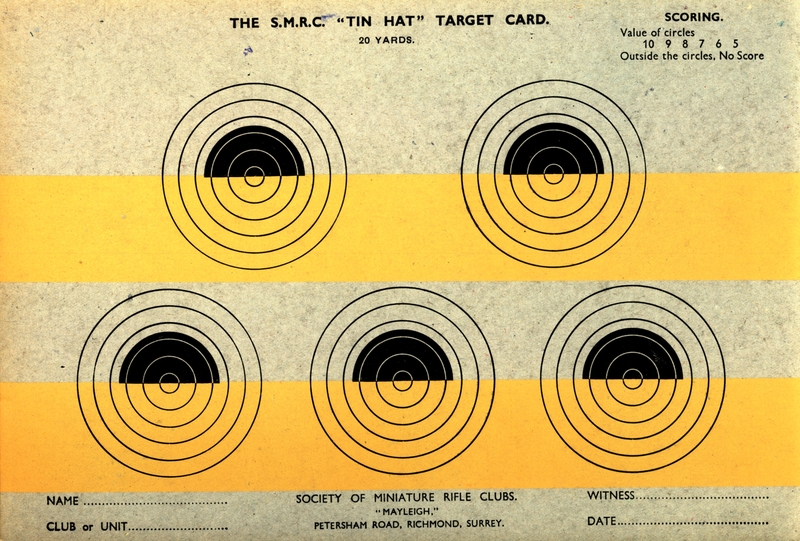 Five rounds were usually fired, on this 'Tin-Hat" target, in a time selected by the Range Officer to suit the capabilities of the cadets. This 25 yard target isintended to be representative of 200 yards on a full-bore range. Click the above image to access a downloadable high resolution JPG file. For scaling, the actual height of the printed card should be 216 mm. Below is the S.M.R.C. 20 yard "TIN HAT" target with 5 aiming marks - for two shots per diagram. Click the above image to access a downloadable high resolution JPG file. For scaling, the actual size of the printed card should be 247 x 165 mm. Above on the left is the "Gill" target to represent 400 yds range at 25 yds. Above to the right is the LDV wartime target (the Local Defence Volunteers - later becoming the Home Guard). Below is the rapid shooting "Timed Limit" card. 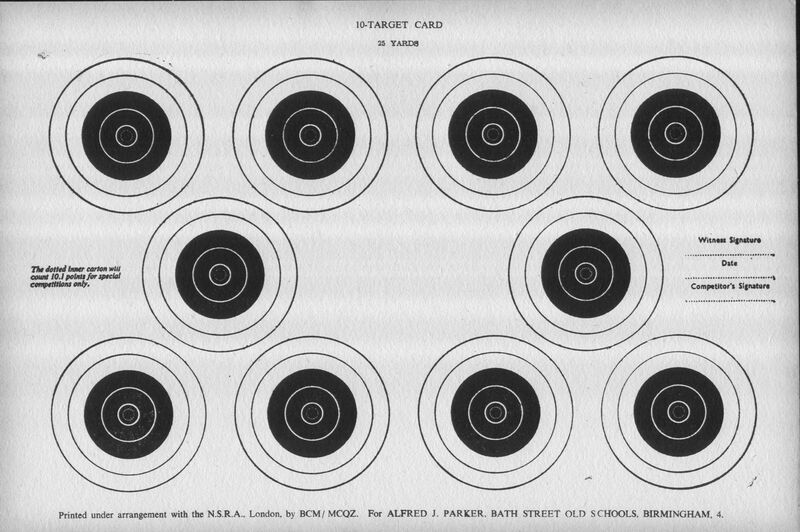 Below is a 1950 era NSRA card for 25 yards, with 10 Targets each diagram with a Carton ( X- ring) printed with a dotted line. This is particularly useful for tie-breaking, especially on an inwrad gauging target such as this where simply touching a scoring line (on the inward side of the bullet hole) gives the higher score. Thus, if your .22 inch bullet gauge touches the dotted carton line, the score will be 10 points for a bull - plus 0.1 point for the carton. Obviously, ten shots are to be fored onto this target, one on each diagram. You may view and download/save a 1.35 MB file of this target by clicking on the image. 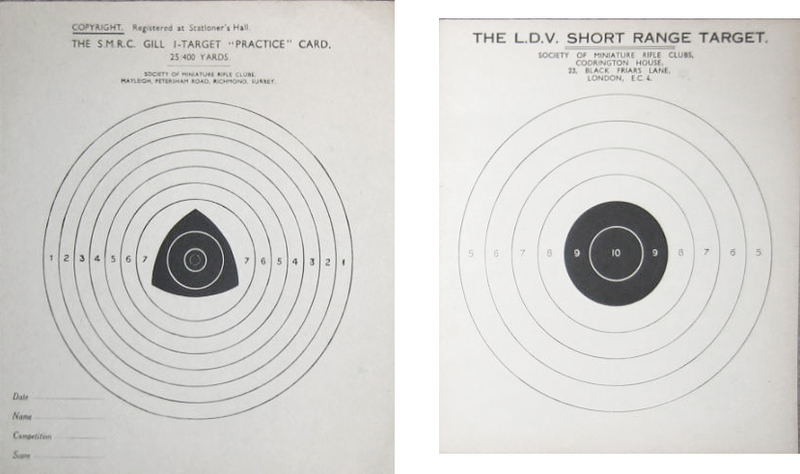 See Dave Clark's "BRITISH TARGETS from the mid 19th. Century"
a smallbore range with early training rifles.